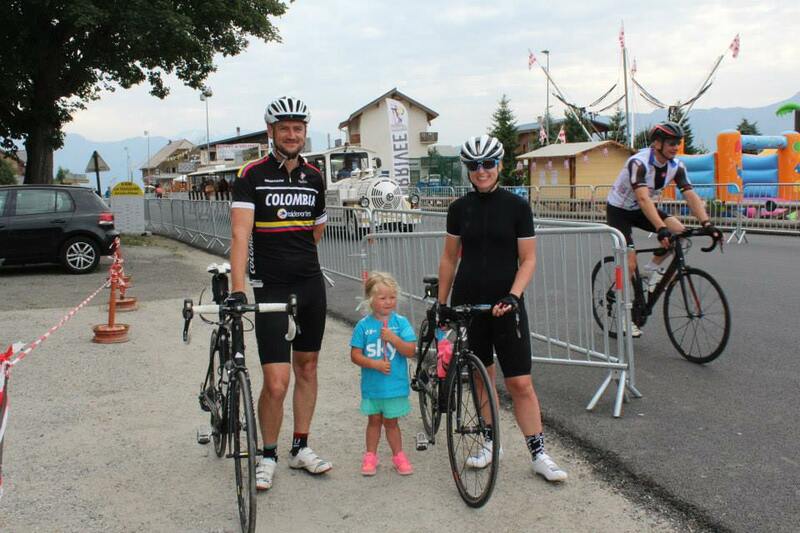 I was watching Bradley Wiggins wear the yellow jersey when I decided I would ride L’Etape du Tour. 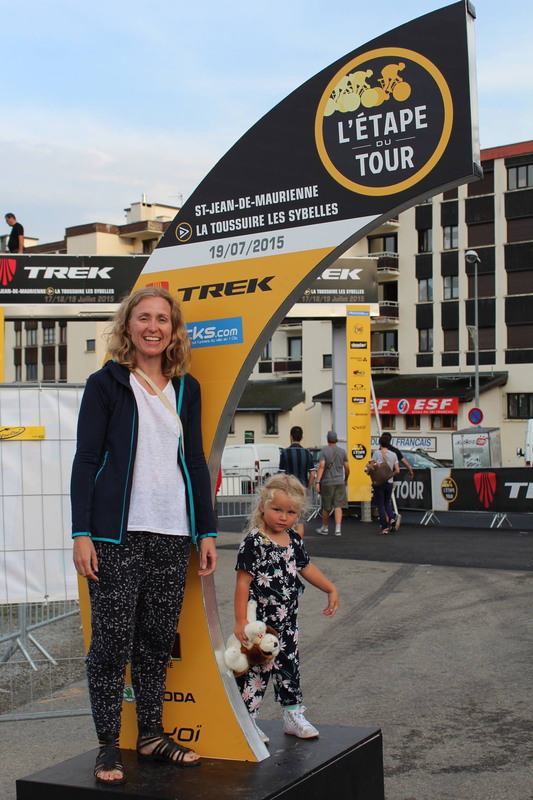 I was on my maternity leave and watching Le Tour had become my daily life. 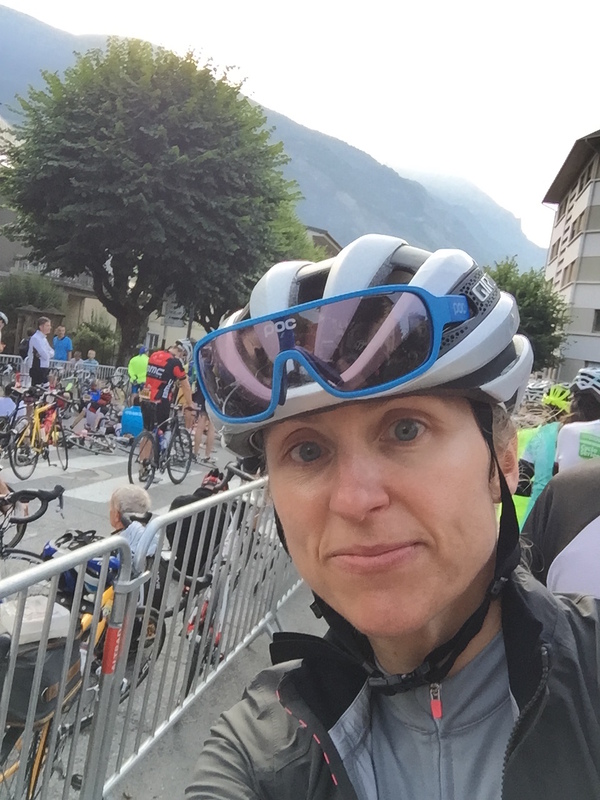 I started reading blogs from cyclists and one, in particular, caught my attention, they talked about the struggle, the adventure, the final climb, passing other riders who were either slumped over their bars or lying in the trees. They described them as praying to anyone who might listen, someone who would help them get up that last mountain. It all sounded a bit far fetched, exaggerated compared to my own cycling experiences but I wanted a piece of this crazy adventure. 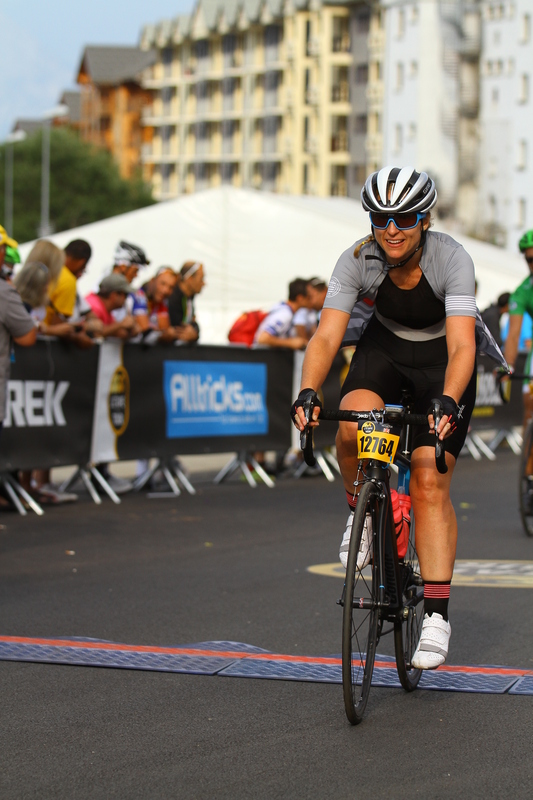 I was so heavily pregnant I could barely get myself off the sofa but I decided I would one day be fit again and enter and ride this event. In the summer of 2014, I became a single Mum and my life changed. In the same month, my Grandad also passed away. 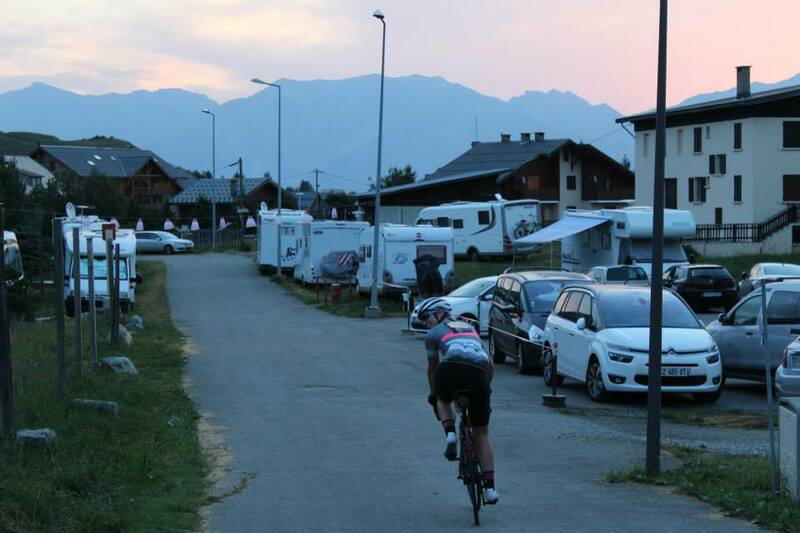 I don’t know if he ever rode his bike in the Alps, it’s sadly a question I won’t answer but on the day of his funeral, and newly single I decided the 2015 L’Etape du Tour would be my year to ride in my Grandad’s honour. Registration opened in November 2014 and I was working in Glasgow at the MTV Awards. 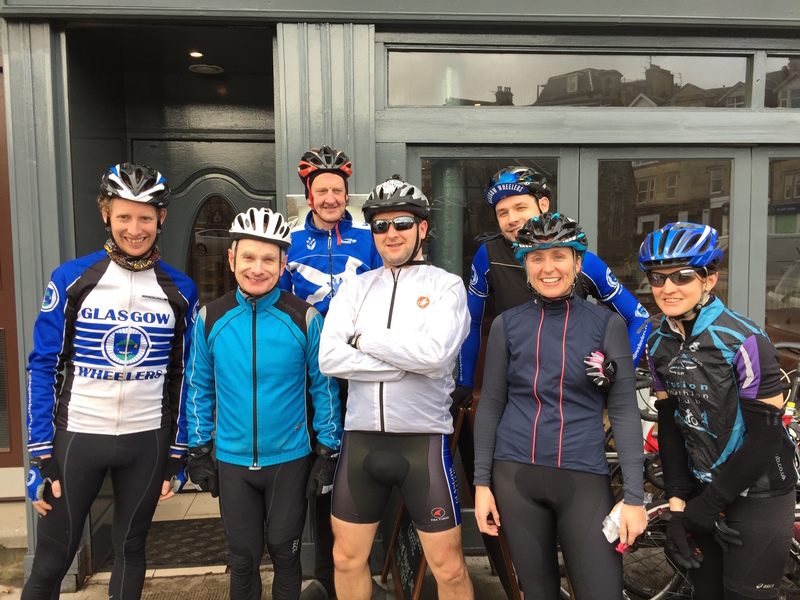 I had my bike with me and I joined the Glasgow Wheelers for their Sunday club ride. As I returned I bumped into my former boss and we joked how times had changed, we used to roll in at that time from partying and here I was coming in fresh-faced from a bike ride. When I signed up I had a plan, I had to be realistic about the size of the challenge verses my lifestyle and lack of experience. My goal was to finish, the time wasn’t important. I work in London, a 3hr commute each day and my job isn’t 9-5 so my midweek training was always indoors, getting up at 05:30 while Savannah was still in bed. I invested in a Kickr and it made a big difference, it made indoor training interesting and more effective. I used the 3LC training videos and I would see immediate improvements. 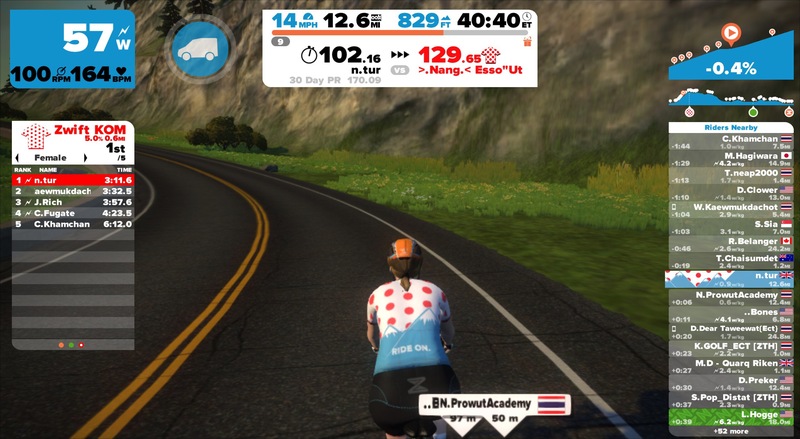 I also logged in to the online community Zwift and I found myself racing against other riders from all over the world, in my living room. I felt a bit bonkers sitting on the train an hour later preparing for work. People kept asking me, have you done enough? The question would set me off into a panic but then I’d remind myself of my plan, the one that revolved around my life and fitting in what I could do. 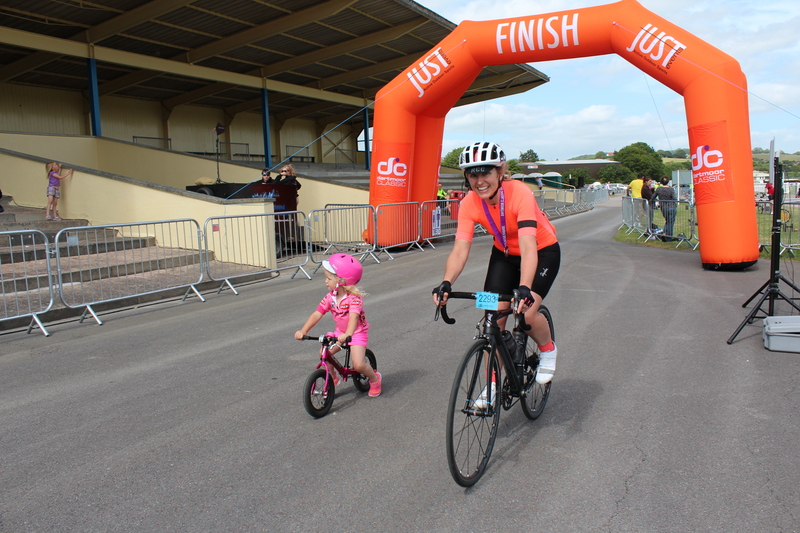 Mini goals included UK cycling events offering some of the best elevation in Yorkshire, The Chilterns and Dartmoor and 2 weeks before I had the all important rest. Savannah and I enjoyed a few days at the beach and the following week, with fresh legs I had 2 of my best rides this year. 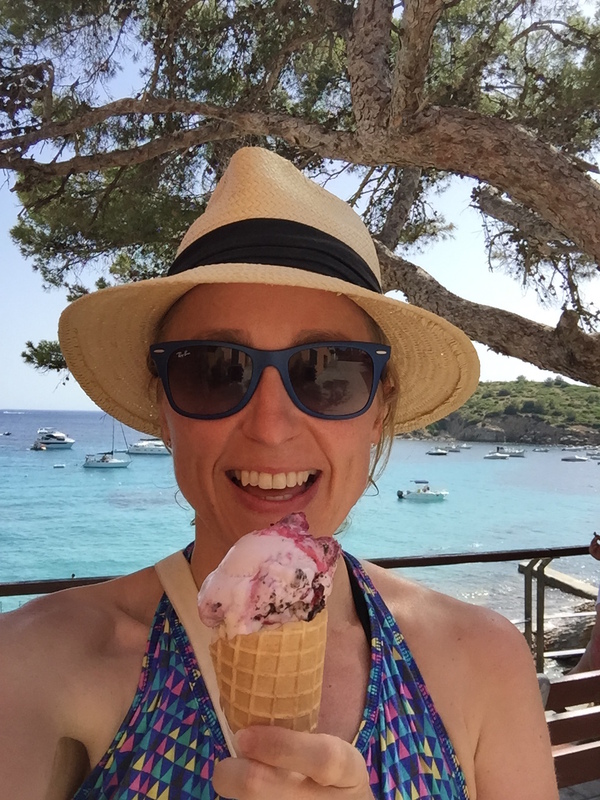 I was starting to feel confident with my fitness and endurance but I wanted to improve my speed so in the final weeks I concentrated on doing hard intervals and more 3LC sessions. The night before L’Etape I knew I would struggle to sleep so I read a story by Graeme Fife “Glory through Suffering”, at first it terrified me and almost sent me into a panic but I kept with it and I broke through into a really good place finishing the story feeling excited by the challenge ahead. I felt reassured I could do it and eventually I drifted off into a lovely sleep. 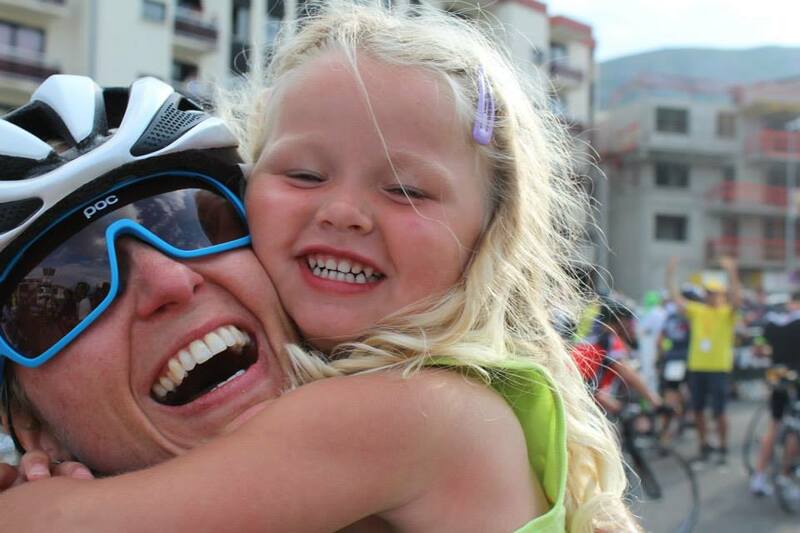 On race day morning it was time to leave and I remember my speech was very tearful. I discussed my finish time with my Mum, I suggested 17:00 as the earliest she might see me. I almost broke down in tears as we said goodbye, I gave her the biggest squeeze. As I rode away she asked me to look back, for a photo and I remember thinking to myself I don’t know when I’ll be back, I felt a mixture of excitement and fear. 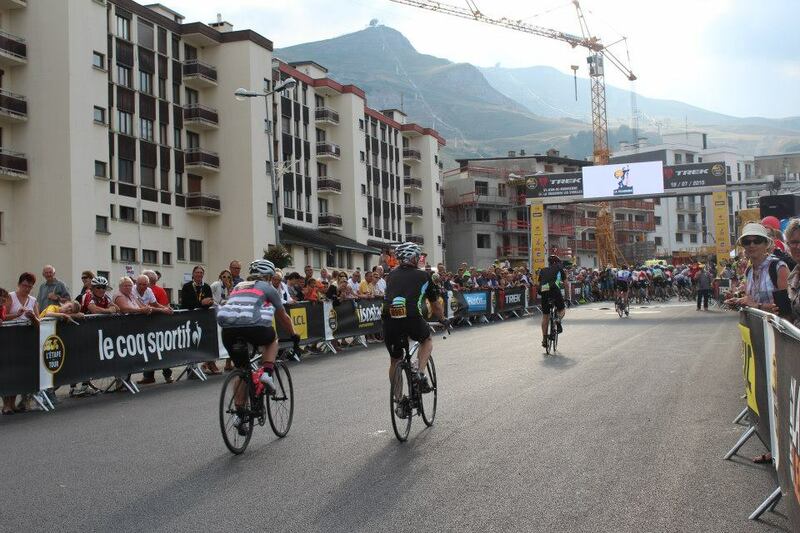 I descended the 19km of La Toussierre in to Saint-Jean-de-Maurienne with Grant, he stayed behind me keeping his own pace slow, it was my first major descent. As we reached the village I was feeling comfortable but then we passed another rider lying on the tarmac, other riders were off their bikes and looking very shaken up and he was in the recovery position. At home I’m very comfortable descending, I enjoy it, I like riding fast but I felt uncomfortable and awkward on those alpine roads. As I started heading towards the start line 2 English ladies called out from the side of the road, they wished me luck and said how much they loved the RCC kit. Those ladies could’ve changed my fortunes that day, I was in a really bad place in my head at that time. Due to my own lack of experience, I was shaken up from seeing the rider crash, it wasn’t a great way to be starting this big ride. Those ladies pulled me back into the world and made me smile. The countdown for my start time was beeping and I was off. I headed out of the town and within minutes I was on my very first Col. I recognised some London Dynamo’s ahead of me, I spoke to the guys briefly and wished them a successful day. The roadside was busy with locals cheering us along and the cheers of “Bravo la Filles” “Bon Courage la Filles” came thick and fast. Another female rider ahead of me was strong, riding at a good pace so I decided to try and catch her. When I did we spoke for a while, she was from Scotland and this was her first Col too, we lost each other somewhere near the top. At the summit I felt happy, it was my first Col, it was a big achievement and it was OK, it was steady and I didn’t struggle but some effort was required to make the cut off time. Above everything else my biggest fear was the pace car, a red Skoda, it follows the back of the event sweeping up riders. People living in the mountains are trapped with the roads closed, reopening is very strict. If the car passes you, your number is removed and you’re returned to the finish line by coach, your bike by lorry, it sounds horrible and humiliating. My bib number was 12764, starting from the back the cut off times were tighter. 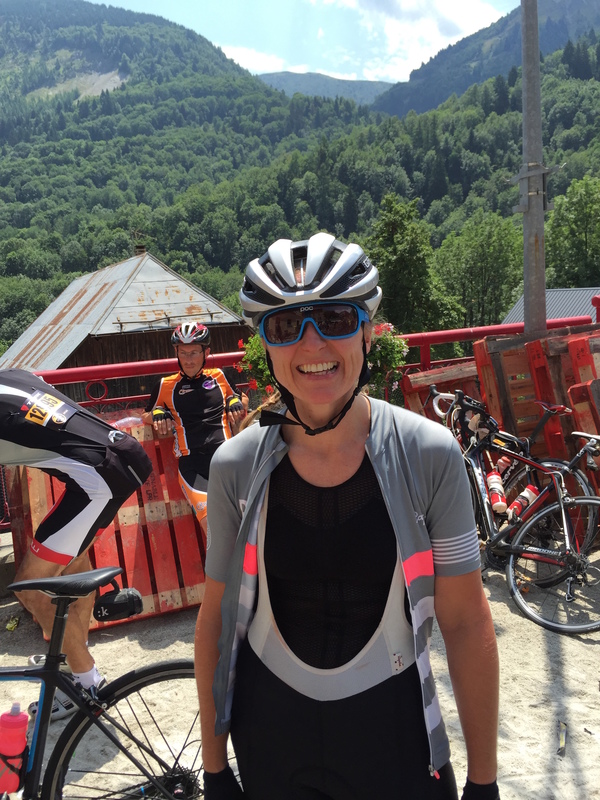 When I reached Col du Chaussy I was 20 minutes ahead of the cutoff time a puncture or crash could close the gap so I filled up my bidons and raced off. I started descending the Chaussy but ahead riders called out “slowing” “stop” and it was obvious we were approaching a significant crash. With one foot out of my pedal, I scooted down the mountain very slowly until I finally stopped and dismounted my bike. An ambulance passed and after the further delay the road was clear and we could continue the descent. At the next feed station, again I stopped to refill my bidon and I grabbed a few snacks, a banana, some figs and other fruit. I checked the cut off times on the chart Grant had made for us and I was only 5 minutes ahead now. Having the times in front of me was proving very useful because I’m not the fastest when a ride starts but I’m good at carrying a group home. 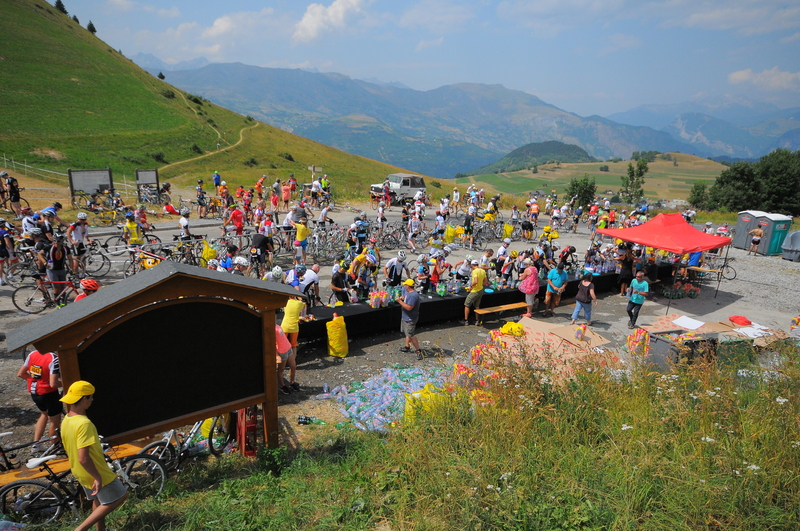 My Col du Glandon plan was working, I’d ridden to the water station without stopping. Now I had another 10km to ride up to the summit. The hardest climb of the day was next and I’d made some time back in the last section. 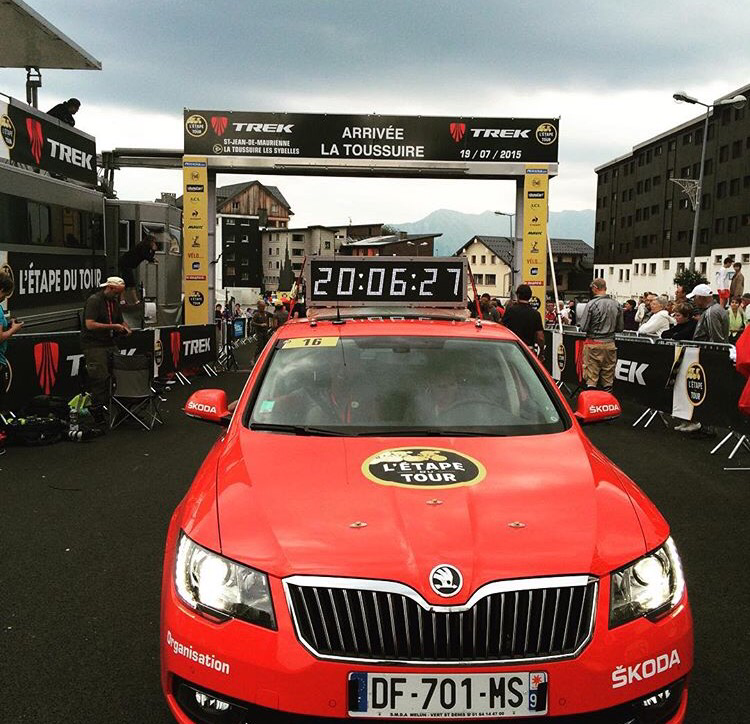 If I could make it over the mighty north face of Col Du Glandon I thought I might never see the red Skoda. At 12:00 in full sun and 39° I knew the Glandon was just a bit bigger than me. 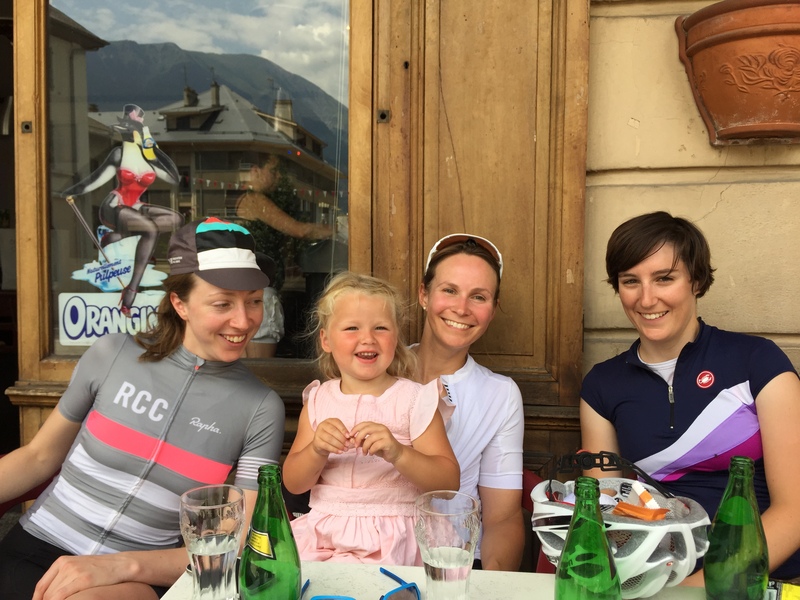 At a Rapha Women’s 100 event just a few weeks earlier Phil from Cyclefit UK had shared great advice about climbing big mountains, he talked about having a plan. I had to find a way to break the Glandon down, I was almost certain the route up would be littered with riders taking shelter from the heat, riding past them would be a psychological battle. The map indicated a water stop halfway so this was my plan, I would aim to ride here without stopping. So when I was riding up those really steep sections and it hurt like I’ve never felt before and people were lying in the trees taking shelter, they had their legs in cold water streams coming off the mountain, I was able to ride past them and ignore them. I wasn’t trying to get to the top, my goal was the water station. The top 3km of the Glandon had legendary status by now, everyone was talking about it all the way up, it’s steep above 12% gradient. I took some comfort that I was from the UK, what our hills lack in length they gain in gradient. I weaved my way through hundreds of riders off their bikes until finally, I had to unclip and stop for a drink. I’d been riding for too long without water so I made the tough decision to stop. As hard as I tried to get going again on that ramp I couldn’t do it and the fear of going over the edge got the better of me so I started walking but I had the next corner in my sight, I was humiliated but I wasn’t beaten. 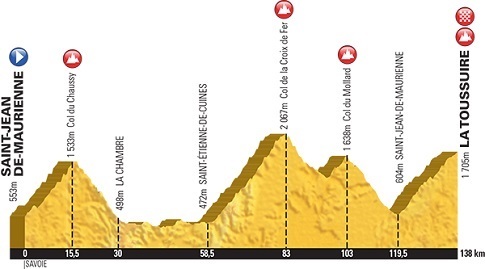 I reached the next corner and I asked a group of resting riders to move to one side, they were bemused by my request but as I rode off up the next steep ramp they gave me a big cheer and I returned with a wave in the air and a shout of “Allez Les Filles”. 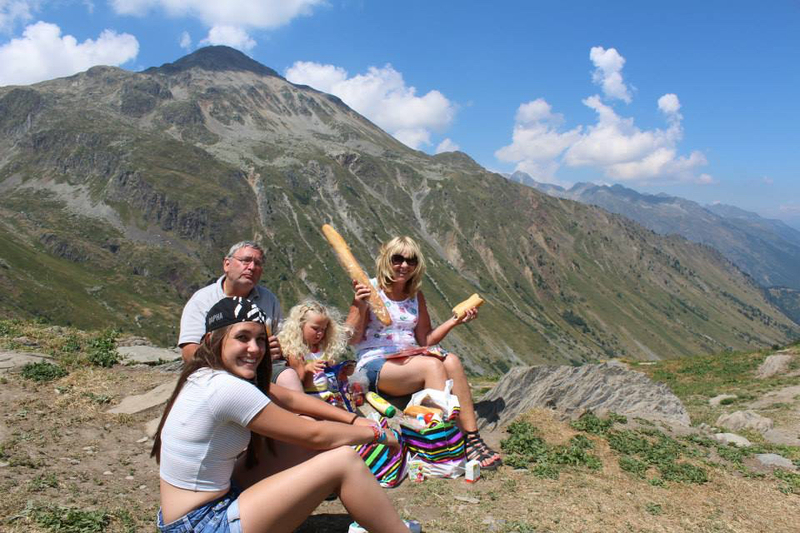 At the summit of Col Du Glandon, it was an overwhelming feeling of great achievement but the mood quickly changed as an official announced the pace car was coming, the road ahead at Col de la Croix de Fer would close in 5 minutes and it was a distance of 4km away. I was queuing for the toilet but had to forget this and jump back on my bike. I managed to catch the wheel of another rider also on a mission and I chased him most of the way to the top, we weaved our way through riders, that car wasn’t going to catch us here. 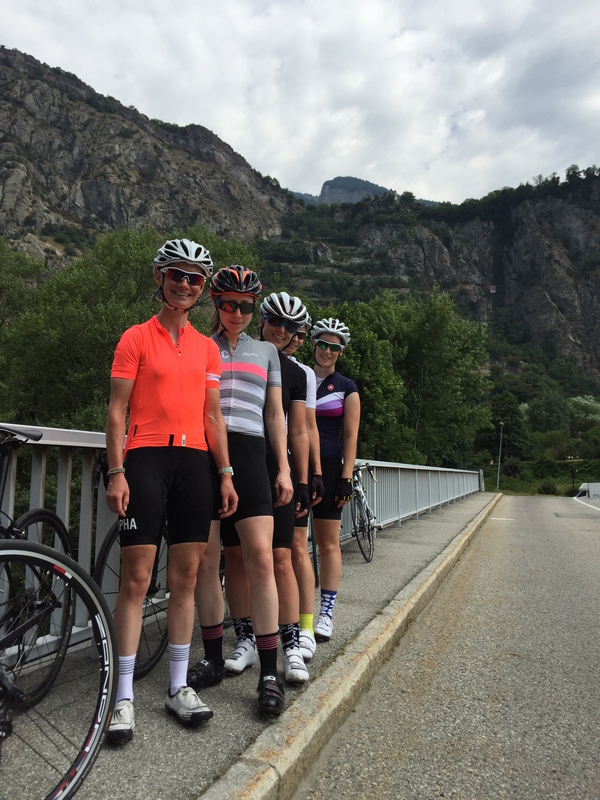 I grouped up with other RCC riders along the Glandon and we joined again as we ascended Col Du Mollard. We were climbing well, passing other riders, it gave me a lot of confidence. As we approached the summit of the Mollard I heard motorbikes approaching from behind, they had been passing by all day but these were greater in number. After the bikes came the sound of a car, the red Skoda, there it was and it drove past me. My heart sank, I was devastated, I didn’t want my ride to end here, I didn’t want to let anyone down, I wanted to cry but I stopped myself. I noticed other riders getting off their bikes and stopping by the roadside, I chose to ignore them. 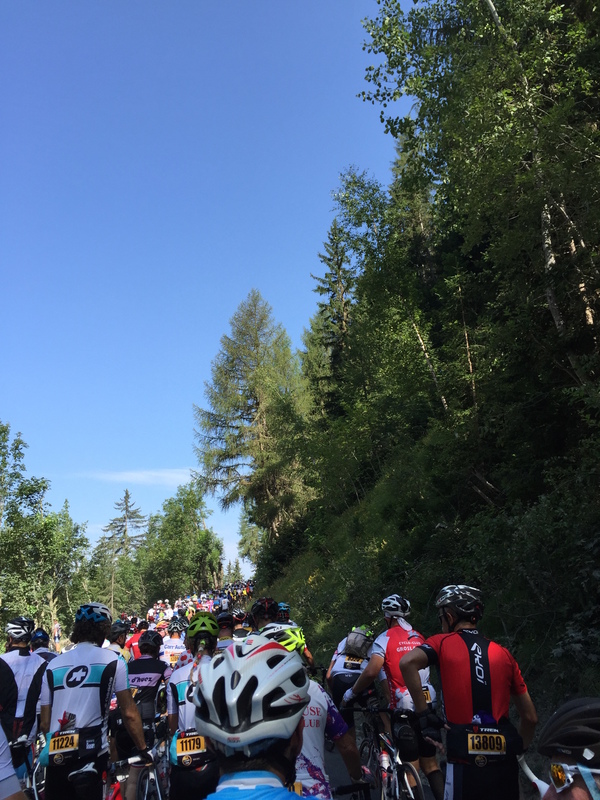 This was a steep and narrow road, it was crowded with riders, it was so hot, my kit was soaked with sweat and so was my skin, my legs were in so much pain but I wasn’t going to stop. I’d ridden over 100km and passed over the summit of 3 Col’s, the finish line was achievable so I kept pushing as hard as I could, I was passing other riders and putting more and more effort in. As I turned the final corner I could see the car stationary at the summit, there was a number of people crowded around it, a man with a loud speaker was giving out instructions and some marshalls were moving road barriers. My bidon was empty but the road ahead was closing, I had an opportunity to overtake the red Skoda again and stay in the race. There was a scurry of people shouting and barriers being moved so I whizzed through. I was still in, I’d made it. I hated every minute of that descent, I was convinced the car was right behind me. It was a gruelling ride down, my body was stiff, my hands were hurting and a number of riders had crashed on the road side. That road felt like it went on forever but when I finally reached flatter ground the hate returned to happiness, maybe a bit of madness, this was starting to get a little bit crazy. 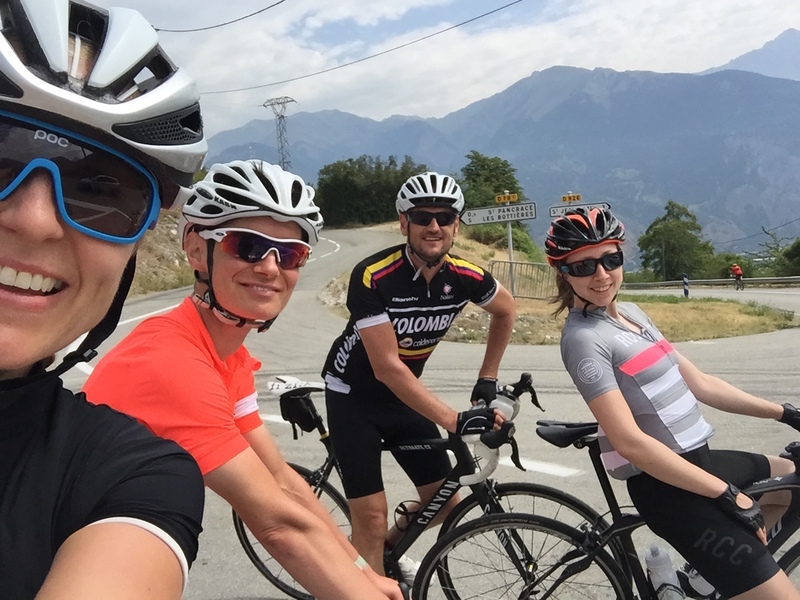 With a big smile on my face, I was now racing towards Saint-Jean-de-Maurienne and I did a few whoops and cheers out loud. My friend Richard told me to save something for the final climb so I kept a packet of Ride Shots in reserve and the final piece of my plan. I always hoped to get a big hug from Savannah at the finish line and I thought it was safe to start dreaming of that moment now. 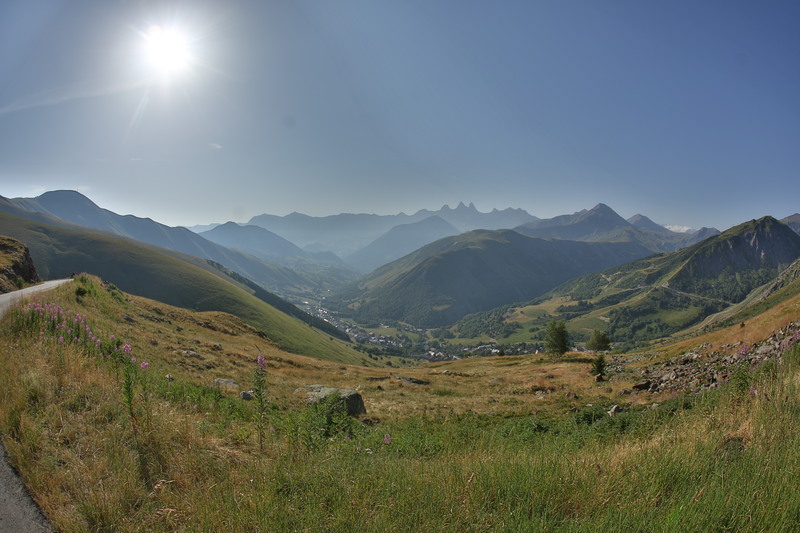 I stopped at the feed station before Saint-Jean-de-Maurienne to compose myself and finally get that toilet break I needed hours ago at the top of the Glandon. La Toussuire is 19km, I’d been up there in the car the day we arrived and assured myself it was manageable but today it was still 39° and I’d been on my bike for 8hrs. The crowds were very generous now “Allez Les Filles” they’d shout and I heard “Go Go Rapha lady” another rider close by said to me “that one was for you”. Those calls made such a difference; it gave me a boost every time. My legs were starting to cramp from the heat but I felt strength knowing the finish line was coming and my family was waiting there for me. As I rode up that final climb, the original story that led me there came flying back into my head. At the bottom of the climb I witnessed those riders slumped over their bars, so close to the end but without the legs to carry them on any further, it was heartbreaking. Riders were suffering from dehydration, they were being sick and they were lying in the trees seeking shelter. Selfishly as I climbed and continued to overtake riders I took great strength from it. My head was mostly down now but I felt as strong as I could. There was a water station after 10km and I knew I would need to refill, I made this my goal to keep going. As I neared a corner I could see another RCC rider stationery at the side of the road, I stopped to check he was OK. We decided to make it to the water station together then onwards to the finish line. At Le Corbier the crowds cheering became a little overwhelming, I was close to tears. I could now see the final summit but it was still a struggle away. A girl rode up next to me complaining about knee pain and said she might give up. 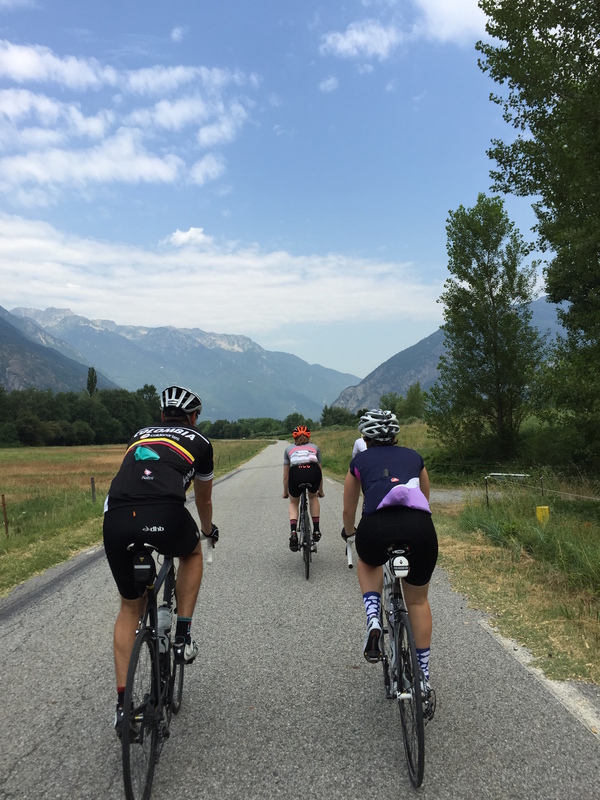 Another rider said it flattens out in La Toussuire, we begged her to keep pushing, she’d come too far to give up now. It was reassuring information for me too, I powered through and the cheers from the roadside grew and grew. As I approached the summit with 2km to go I looked to my right and for the first time that day I could really appreciate the beauty of being up so high, it was magical. As I turned the final corner into the village I couldn’t help smile, the biggest smile, I knew I’d made it. People were out on their balconies, the route was crowded with people, cowbells were ringing, people were cheering, the atmosphere was electric and some tears started rolling down my face but I kept smiling. Instead of sprinting that final stretch I just wanted to take it all in and find my family in the crowd. I turned the last corner and spotted them, I called out and they heard me and looked so happy. 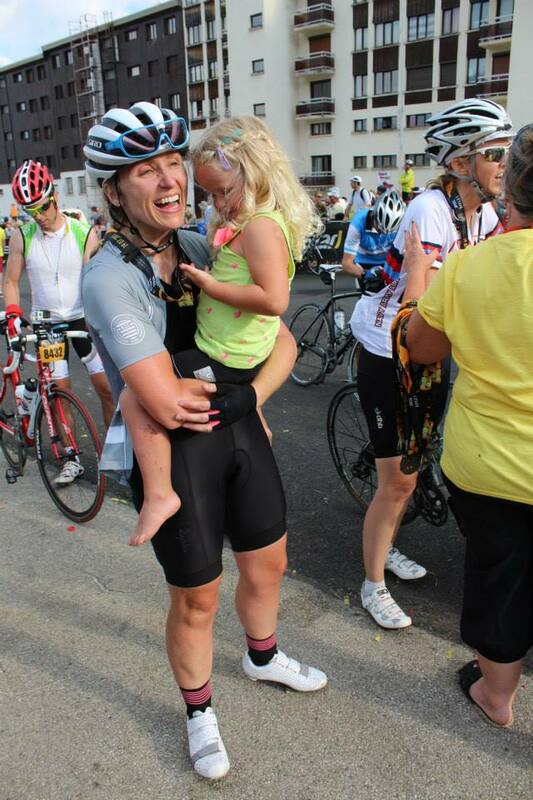 I pedalled on to the finish line, I felt half crazy, a bit delirious, it had been such an adventure. 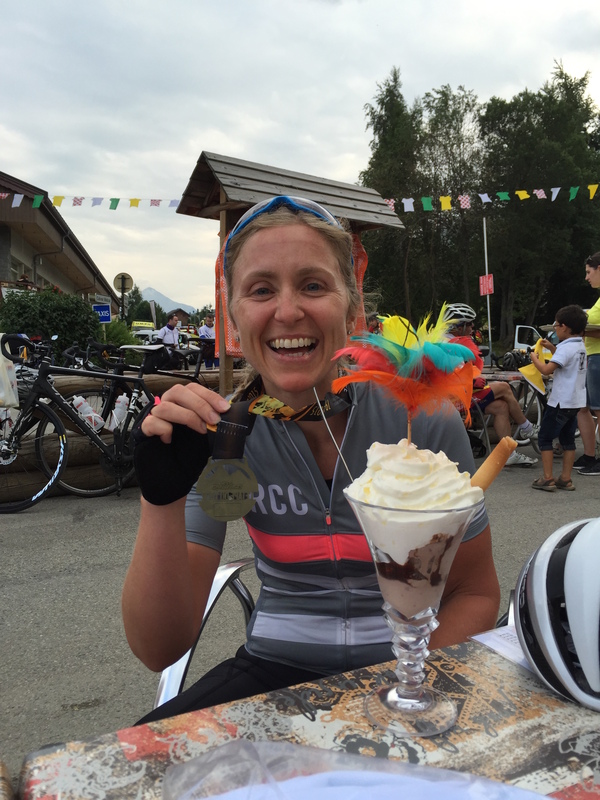 When I got off my bike I was so overwhelmed, the satisfaction in completing the ride was enormous. 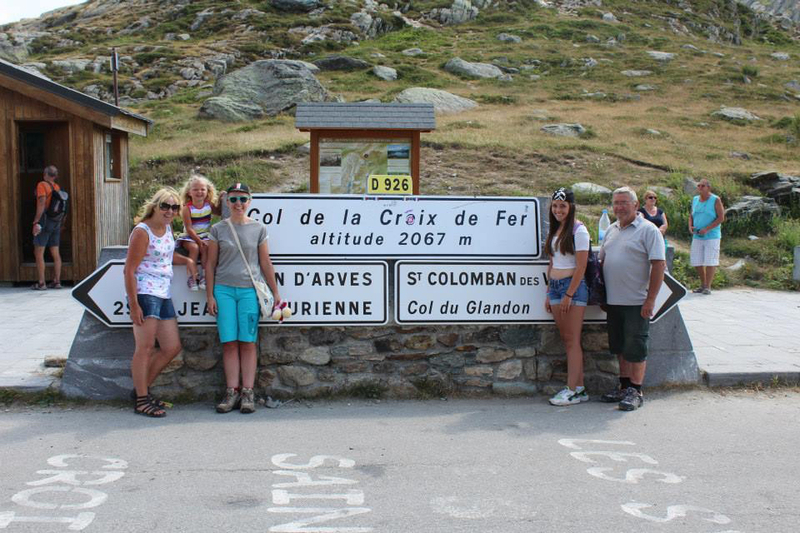 I had done it, I had ridden a stage of Le Tour De France, my Granddad would be so proud of me, I was so proud of myself. I joined my family, my Mum gave me the best hug. Savannah lept into my arms, she gave me that hug, I was so weak by now but I managed to hold on to her and I carried her through the finish area. As a lady placed a medal over my head Savannah told me I was her super hero and it completed my plan, it was a great adventure. 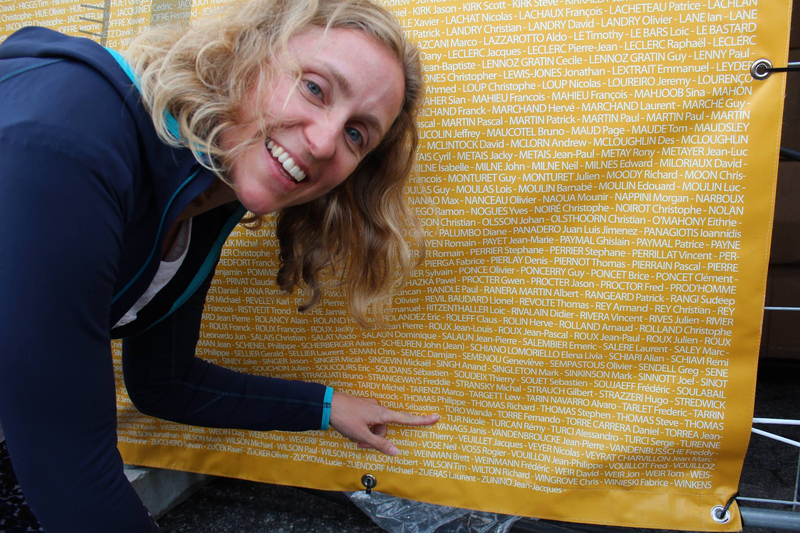 9567 men finished L’Etape du Tour and 407 women finished L’Etape du Tour, I’m so proud to be one of them. RCC provided support to riding members with warm up rides, bike checks, massage and food at the finish. 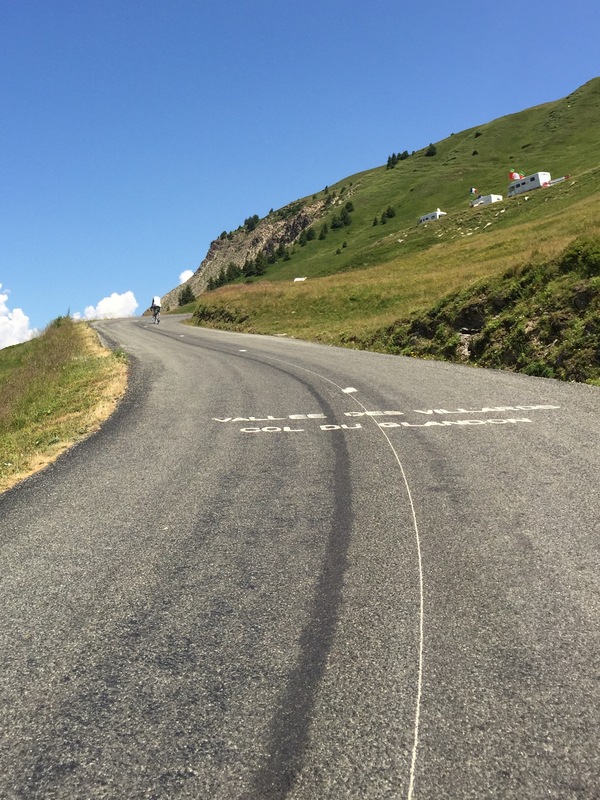 The day after L’Etape we drove up Col Du Glandon, I took this photo out of the car window so it gives you an idea of how steep the top is. Great story! It just shows you what you can do with a little self belief and encouragement from others … as well as a lot of preparation and hard work!! Well done. Good luck with your next challenge! Thank you Paul, glad you enjoyed it. Finding my next challenge is proving to be the next challenge, I will find something, there’s a lot of choice out there.